Well, it is official, I have submitted a recipe for a recipe contest for a local restaurant group. As you will see below it has gone through a number of versions and a few elements just didn’t come together the way I planned. As I mentioned, recipe testing is tough and has it’s ebbs and flows. However, it is a great opportunity to create and explore in the world of food. So, what did we end up making? I talked about it in my “Recipe Test Launch” post, but lets review. 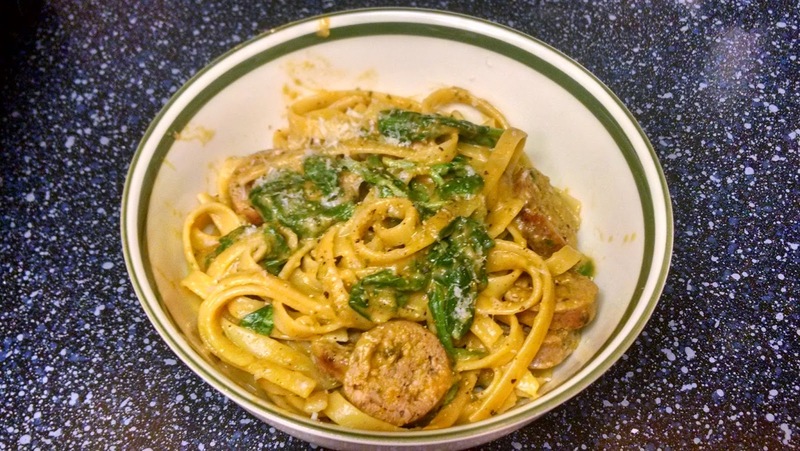 The dish started off as roasted red pepper basil pasta with sausage, spinach, and arugula. My twist on the roasted red pepper sauce was to add to fresh basil to give the sauce a nice floral, herbaceous aroma. It made sense and I knew the flavors would meld together nicely, but finding the balance presented a few challenges. I have listed a few notes below so you can understand the progression of the life of the sauce. Sauce #1 had good color, but sorely lacked seasoning and flavor profile I wanted. Sauce #2 had good flavor, but had one glaring issue. The color. The color was something a lot of parents with infants can relate to.and that is not how stay in the running to win a recipe contest. I will leave it at that so we don’t have to think about it anymore. Sauce #3 was seasoned very well. Even on the first try the sauce was on the edge of being to heavily seasoned with salt and pepper, but was surprisingly deceptive. It became a little Jekyll and Hyde — as when we first tasted it the sauce it was flavorful, rich. However, after dinner I tasted the sauce again, and this time, it was totally different!! I was stumped that the complexity of the sauce had changed so quickly. Such a shame! After thinking through the sauce complexity and using what remaining hours I had left to ponder how to make the sauce work, I created a fourth version of sauce. I made a few more adjustments, which I based off of Sauce #3, and settled on a solid version. Yes, the sauce still passed quality control after it had sat and had a chance to come together. So, without further adieu, I will now present the recipe for this amazing, flavorful sauce. Bring 6 qts of water to boil, add 3 tablespoons of kosher salt, and cook pasta until al dente. While the pasta is cooking, add the first 7 ingredients into a food processor or blender to prepare the red pepper sauce. Process the ingredients for about 2-3 minutes until the sauce is smooth and everything is incorporated. Once the sauce is prepared add it and the pasta into a saute pan, and turn to medium ot medium low heat. Stir the pasta through with the sauce until the noodles are coated and the sauce is warmed through. Add 1/2 cup of spinach and 1/2 cup of arugula to the pan, combining the greens with the pasta in the warm saute pan until the greens begin to wilt, this should take about 90 seconds or so. Place the noodles and greens in a bowl or on a plate, and serve with freshly grated Parmesan cheese on top. We have covered how to roast red peppers in a previous post. Remember the liquid that settles at the bottom of the bowl while the peppers steam are what you are going to use as the reserved liquid. If you have brought all the components together in concert with each other, then you will have something that will look this photo below.